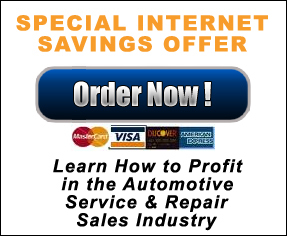 Reveals the Real Secrets of Automotive Service and Repair Sales Success! Terry Greenhut’s new book is now available. It will teach you everything you need to know about marketing and selling your services to retail, wholesale, and fleet customers. But don’t tell too many people about it. If your competitors find out they might buy it and learn how to get top dollar for their work too. Then they might even learn how to attract the same wholesale, fleet, and retail customers that you want. On the other hand, if your competitors learn to do a really good job of dealing with their customers they might start to charge more for their work making it easier for you to get your price. That’s the dilemma…. Should we tell them about the book or not? Let’s throw caution to the wind and tell them. In fact, let’s tell the whole Auto Repair and Transmission Industry. Then maybe we can finally get everyone making good money. Wouldn’t that be great? 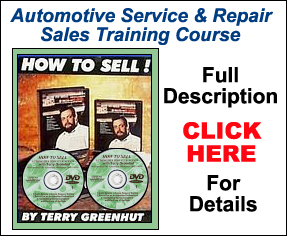 “How to Market and Sell Automotive and Transmission Service and Repair” is the result of Terry Greenhut’s 30 years of research and practical in-shop application of the best techniques for attracting and selling to customers in the Automotive Aftermarket. This book will teach you how to make your phone ring with more fleet, wholesale and retail customers than you’ve ever had before. You’ll master the telephone techniques that will turn retail price shoppers into eager customers. You’ll learn how to recognize all of the different customer types so you will better know how to deal with each. You’ll discover a simple-to-follow system for walking the customer through the entire sales process including the all important qualifying questions and presentation of the service recommendations. Then you will find out how to break through the “glass ceiling” of self doubt so you can charge the prices you need to be profitable. In addition you will become highly skilled at handling every price objection you are ever likely to hear and you’ll find out how to follow-up to keep your customers coming back year after year. In other words, this book will teach you how to build a very successful automotive business! 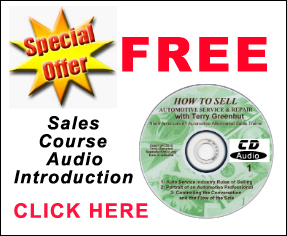 If you want to learn the best techniques for marketing and selling your repair and service work this is the book for you. In its 450+ pages lie the answers you’ve been looking for. Curl up with this book for a few nights and you’ll be ready to make more money in the automobile business than many have ever thought possible. For less than a $100 investment, a little easy reading, and some practical application of the techniques you can become a top-notch sales professional in no time. Anyone can do it. Order yours today! In fact, you may want to order one for each of your associates and competitors as well. GET A JUMP ON YOUR COMPETITION – ORDER TERRY’S NEW BOOK ONLINE TODAY! You can place your order securely online and we will rush your order to you.